We love your questions! Please take advantage of this free coaching from nationally renowned experts in the fields of college admissions and academic life coaching for students. What are the best schools to become a Physician’s Assistant? Megan reveals some surprising facts about how to choose schools when you are interested in the medical professions. 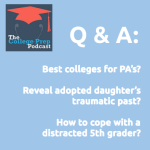 Should I tell my adopted daughter about her traumatic past so that we can include it in her college application? Megan and Gretchen discuss the importance of never doing anything just to get into college. However, Megan reveals an interesting workaround if you there is something you need a school to know about your child, but you prefer that the child never finds out. How do I keep my distracted, disorganized 5th grader together without going crazy myself? Gretchen discusses the ins and outs of attention deficit disorder, puberty, and how to support a child when teachers are too busy to help. Where are the best places to look for scholarships? Megan reveals some surprising ways kids can earn scholarship money. She recommends that families also check out Fast Web, Scholarships.com, College Board, Merit Aid, and College Net.